Our take on a wildly unique flavor profile exhibited by coffees from India. Before sea transportation was modernized, coffees from this region took a long and soggy journey to European ports. The exposure to the elements on the trip imparted wild complexities upon the flavors in the cup. Nowadays, shipping by sea is much faster and secure, which simplifies those complexities. The prized profile of old has since been artificially derived through intentional exposure to the elements. 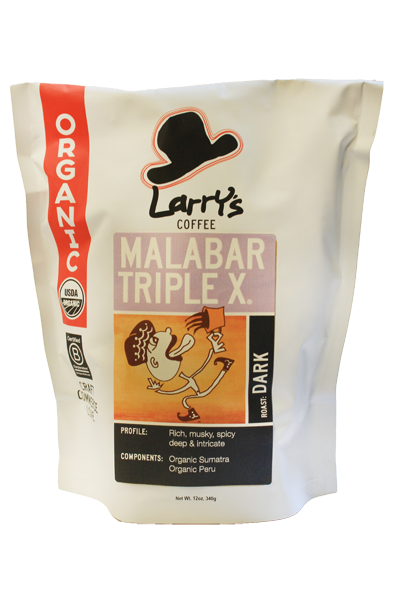 Our blend, sourced from fair trade coffee farms around the world, attempts to recreate the rich and musky mysteries that Larry loved about monsooned Indian coffee. Full bodied, spicy, and nutty, with a sweet undercurrent brought about by the darker roasting style.